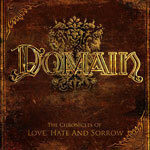 Domain's latest 'Chronicles Of Love, Hate, and Sorrow' is release for which I was eagerly waiting. I've come to Domain late having been a stalwart fan since 2005's marvelous 'Last Days Of Utopia. To say that I'm disappointed with 'Chronicles' is probably not fair because Domain delivers genuine melodic power metal with efficient credibility. Let's just say that I expected more than the same old same old, and certainly more than another soapbox for Axel Ritt's well known guitar skills. On 'Chronicles' Carsten Schultz is gone being replaced by vocalist Nicolaj Ruhnow (Irony). To be honest, I was put off at first by his style, but he grew on me thanks to stunning performances on 'He Is Back,' 'The Last Dance,' and 'Twelve O'Clock. Ruhnow is also responsible for the lyrical content of 'Chronicle' which is based on the epistolary novel Die Leiden Des Jungen Wether by German poet Johann Wolfgang von Goethe. This fact alone puts him head and shoulders, at least intellectually, above most metal singers and garners my appreciation. Otherwise, Domain has merely become a showcase for guitarist Axel 'Ironfinger' Ritt massive fret fireworks. Therefore, it may be more positive to note which songs had his most intriguing solos. I would go with 'Sweeping Scars,' 'Angel Above,' 'Circle of Give and Take,' and the novel work on 'Two Brothers.' Ritt is still one of the best. Before I completely pan Domain's 'The Chronicles of Love, Hate, and Sorrow,' I should probably give it another listen or two. I wouldn't be surprised if I'm surprised and it grows on me. Still, I can easily recommend this to Domain fans everywhere. Further reports as they warrant. To say that I'm disappointed with 'Chronicles' is probably not fair because Domain delivers genuine melodic power metal with efficient credibility. Let's just say that I expected more than the same old same old, and certainly more than another soapbox for Axel Ritt's well known guitar skills.